I found the following email in the Spam folder of my Gmail Account this morning. Fortunately for me and all the other Google Adwords advertisers who use Gmail, Google is able to identify and flag nefarious phishing acts like this one featured in the above email. 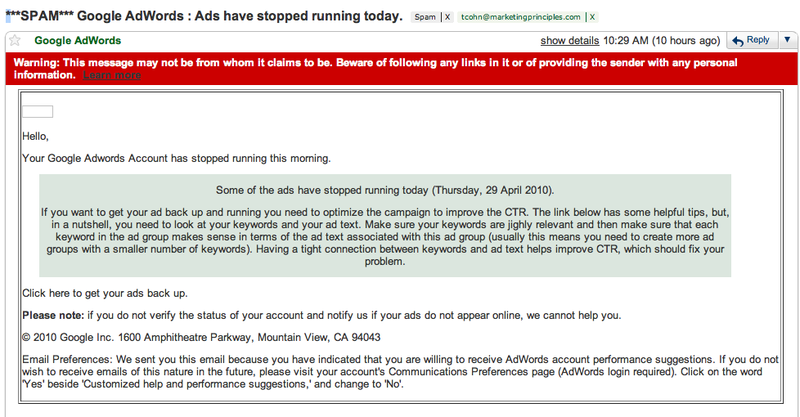 This entry was posted on April 29, 2010 at 7:49 pm and is filed under Sample Adwords Phishing Attempt. You can follow any responses to this entry through the RSS 2.0 feed. You can leave a response, or trackback from your own site.